Patrick McEvoy-Halston: Interesting; like the idea of melding. We do see the Germans, though. I felt that was part of what Tom Hardy's character accomplishes in the end... he punctures into, not the Blitz, or Battle of Britain, but the successful subsequent continent invasion -- Operation Overlord; Normandy. I thought the film shows us a false existential crisis. The young troops have taken a step outside their regular lives and are in a place of dread, and aren't sure upon their return if their country -- their seniors, especially, who are featured in the film -- is with them. But it's false precisely because as troops they exist beyond, as you call it, present-day ironic self reflection and bitter partisanship, or as another way of saying it, beyond a democratic impetus and only on a path to willing self-sacrifice and war, so there was no real way their grim-mooded country would have abandoned them. Patrick McEvoy-Halston: If this was who they were, those who when "faced with decisions that could mean life or death for themselves and others, mastered their emotions and acted thoughtfully, responsibly, honorably, potentially self-sacrificingly for the good of a collective mission that they’re all aware of: to get back to Great Britain in order to defend it against a likely attack by Germany," then who wouldn't want to emulate them... have them as a legitimate source of daddy issues? But they seem a little more silly when what they're up to becomes, not emulating daddy, reaching up and out to something greater, but those regressing from being already partly individuated adults back into good sons doing whatever hell their mother country bids of them... all so that they can bathe in the reception of acceptance, love and gratitude of a nation, full of maternal projections. It struck me as falsely existential... young men out there on their own, unsure not only if they'll get back but how they'll be received when they do. It's false, for, for being willing sacrifices, and for deferring independent judgment for playing the part their elders want for them... for being all that you ascribe to them, we never sensed they were at risk of abandonment. If they all died there on the beach, WE would have called out to them to let them know how we loved them... how proud we were of them. It's not only or primarily victory we asked of them; but that they risked death and died so that the virtue of a country could be reborn again. KB: I'm really interested in this criticism of the film which has emerged from a number of leading voices. I'm not a huge Nolan fan but this film really worked for me. The only thing that matters is survival. That most animal of instincts. I found humanity everywhere in the film, in the little moments. Contrast that against the magnitude of the events taking place and you have a wonderful balance. I don't think we need to know anything more of the characters than what we're given. Their lives are ordinary, their feelings written on the faces and in their body language. Surprised people think it's unemotional. It's restrained certainly, again in contrast to the majesty of the score and cinematography, but it's all there I think - in the undercurrent. Patrick McEvoy-Halston: If the only thing that matters is survival, why is there such a concern in the film whether people approved of them... that people saw what they had accomplished or had tried to accomplish? Tom Hardy's character doesn't seem to allow much for the importance of survival, but quite a bit for... let's be a bit ungenerous here, the applause of his mates as he becomes a legend out of history? I'm being a bit crass with Hardy, though... I was actually moved by his decision to help, even if I didn't think it portrayed as all that hard a one... well, you know what, if I turn around a military ship full of people will vanish into the sea... I'm sure I could dissuade myself from indulging in such a feast of an encounter! It was also a thrill to see the 17-year-old act with such intelligence and leadership. To be under assault, and yet keeping your head and your reasoning ability intact -- how wonderful to experience yourself like that! KB: I think there's grounds to argue that the concept of war, which I think defines the action of the film, only cares about survival. The cinematic storytelling reflects that. I don't think Hardy's character was thinking of the applause down below - literally just trying to take his opposite number down. That was his goal. 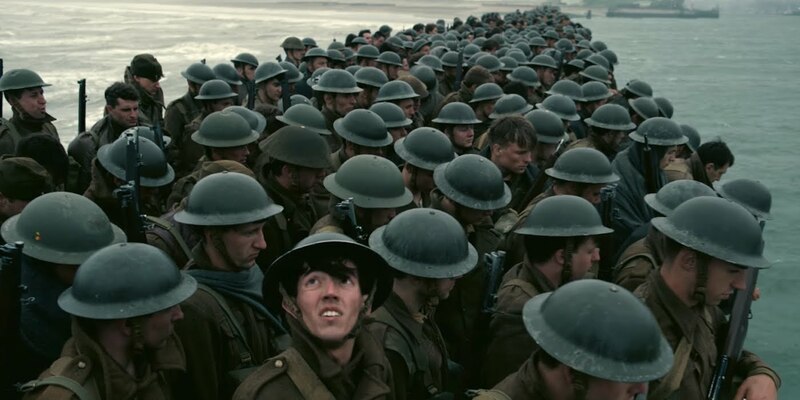 Rylance's character's goal was merely to save as many soldiers as possible. Again, saving lives is the key. That was the whole point of Dunkirk. It wasn't in any way a militaristic offensive. It was an evacuation, a defeat - but hundreds of thousands of lives were saved and that's why it was viewed victoriously by Churchill and more generally by the civilian public. The film reflects that quietly during the coda but I still think survival is it. Styles' character even quips it: all we did was survive. Patrick McEvoy-Halston: They survived... AND were approved -- isn't the nature of their reception what prompted Styles' remark... so also part of the film? Our experience of it is as a survival film, but also as much a reception film -- what survival, and loss... what heroic actions, begat in terms of approval or scorn. I actually agree that there is a sense that Rylance and Hardy's characters are only thinking on assisting, on saving lives... but since they also end up being both either granted the status of approval-granters (Rylance) from doing something that was appreciated and approved, or simply under heavy reception of approval (Tom Hardy--war god), it's difficult to situate ourselves within them and not be lying to ourselves if we imagined we weren't doing so also for the love and glory their actions gave to them, though the opportunity is certainly afforded us. AN: Disagree. Anonymity was a crux of the movie. All those nameless, barely seen humans. Many of whom lost their stories on that beach or subsequent beaches. That is the horror. I was very moved. To the point where days later I was still questioning why and what did I see. I was born in Scotland. My father and grandfather, my uncles all served. One lost a limb. Others their lives. Well done, as one of the faceless I connected. Patrick McEvoy-Halston: And if the Germans make a film equivalent to this, delineating the service of all their anonymous throng in WW2, with their limbs and lives lost, their stories, far too early terminated, this would be a good cause to... wonder how much to exult when films make giving so much value to the faceless, a sign of our moral improvement? AN: Of course not. That's what is accosted. Our moral center. All these people whose lives were cut short. It's repugnant. Those in power repeatedly use the anonymous as cannon fodder. Is one side better than the other? I believe it was much clearer then than now. But to those on the field the terror was equally as real, one to the other. Most of the film is spent with hordes all facing home. The yearning was palpable. Patrick McEvoy-Halston: The article you link us to is about a heroic man who earned tons of war medals and who still garners "proper" salutes, possessed of wise tales on the horrors of war; about what kids these days need to understand on how the affairs of the world aren't just entertainment. What's missing in the loss is a genuine sense OF loss... they all seem to have acquired so much sanctity, thereby. Doesn't a tearful mother lean near them, sad for their loss?... in our imaginations, but perhaps in their own as well? Aren't they more deserving of it, for their being used and neglected? If they actually weren't at all, wouldn't a perfect image be frustrated and prove an annoyance one's temporarily cornered into having to abide? He may not have told about how the war was about those in power using the anonymous as cannon fodder, but this sort of narratizing is probably more popular with classes of people who are always for war (Michael Bay does it a lot, which his audience licks up) than it is even with liberal peaceniks, so if he did it'd be digested as without confusion as a meal you were actually expecting. I like your comment about the yearning being palpable. I agree that it was.